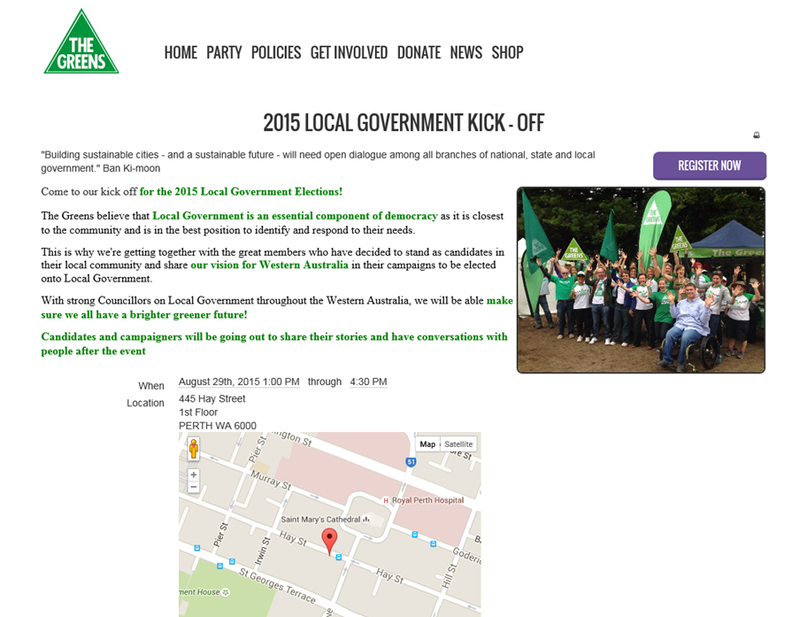 Greens play dirty pool to get Mayor in to Canning? CHRISTINE CUNNINGHAM seems to want power. She’s run for elections at state and federal level; no doubt she will again. It’s the way she may be going about trying for the top position here in Canning we’re concerned with now. Ms Cunningham is a member of the WA Greens, in fact she’s its former long-term Co-Convenor…. and the Greens – as a party – are acting to help as many members as possible get on to WA councils, come October 17th. The Greens refer to it as “getting together [to] share our Vision for Western Australia in their campaigns to be elected on to local government”. How might this occur? Well, for a start the nominees need money. The Greens are flocking to “crowd funding” platforms – the new Black – which Ms Cunningham is also using to raise money for her campaign, describing it as “a great way to appeal directly to the community”. But which community? Exactly where will Ms Cunningham’s funds be coming from? Already two mayoral candidates for Canning have raised concerns that Ms Cunningham’s campaign features “anonymous donations”, which the WA Electoral Commission has stated must be either returned or disclaimed. Perhaps crowd funding needs more investigation as to its use as a means to raise money for election bids; our understanding is that “anonymous” donors are anonymous in so much as they’ve elected not to have their personal details displayed online. Ms Cunningham, we assume, would be fully aware of who is donating to her campaign otherwise – how else could the money be collected? But will that money come largely from within the Canning community, or elsewhere? And for what purpose? Money raising bids like this are usually placed under categories such as “community” – too general to pick up interest from a casual observer looking to help someone, unlikely to benefit from the platform’s global audience. So how do you get people to pony up, in Ms Cunningham’s case, $10,000 in a short period of time? It’s most likely to occur when you know many people and/or have access to networks and distribution lists – the Greens’ membership, for example. Just send out the link to the donation site. Easy. So, apart from the fact funds for Ms Cunningham’s campaign may well come from other council areas, across Australia or even the world – and assorted Greens – she could well receive other benefits to her campaign such as door knockers, letter box droppers, etc from the ambitious party she is a member of. The real bonus to Ms Cunningham using a crowd funding platform is that it has the potential to cost her much less to run for Mayor. Most of the time the rules are that if you don’t raise all the money you have asked for, within a specific time frame, you don’t get any of it. Ms Cunningham’s bid for $10,000 to spend on her campaign could mean that if her “crowd” raises, say, $8,000, all she then has to do is top it up to $10,000 and she gets the lot to spend. UPDATE: Ms Cunningham is using a crowd funding platform that has no goal requirements (ie, must reach 10K in 30 days). Therefore any and all money donated will be received by the fund raiser, regardless. Maximum thrust, minimal effort. Nice if you can get it, but is all this “dirty pool”, ultimately? Will Ms Cunningham, through use of a funds-from-anyone-anywhere portal, and potentially through help from the WA and even Australian Greens membership, gain an unfair advantage over other mayoral candidates? And will the only bill to come due be one paid by the Canning community, should Ms Cunningham get in as Mayor? The Greens will expect something in return – those shared values played out, for one. CAVEAT: Diana Ryan, this blog’s Convenor, is a former student and associate of both the schools of sustainability that have existed in Perth and early developer of the Knowledge Arc Light Rail project, but is not convinced “Green” is better than any other colour in the bid for a better world. Ironically – or perhaps predictably – “sustainability” has become more about power than prosperity for all. Stay tuned for a look at the City of Canning’s bid to be a bastion of sustainability – boy, has that cost ratepayers more than was necessary! Ms Cunningham has stated to CanningAccountability that “As I am sure you are aware I am a member of the Greens and I will not hide that I favour policies aligned to financial, environmental and community sustainability – as my party does. However, I steadfastly believe that Councils must be independent. I am running as non-aligned and asking Greens, Lib, Labor and a-political friends to all help my campaign”. In that case, and to dispel any concerns the community is beginning to feel that this is yet another council a political party seeks to infiltrate, we hope Ms Cunningham will reveal where her funding is coming from, progressively – principally how many donations have come from those who actually live in the City of Canning out of the sum total of donors, and the amount – and disclose any and all involvement the Greens, their members and their 2015 Local Government Kick Off initiative may play in her bid to be Mayor of Canning. Virtually all Mayoral candidates have mentioned “integrity”, “a Canning we can be proud of” and “to see [Canning] regain its identity”. Let’s hope they all stand up to community scrutiny! Great article Diana. It’s interesting to see the Green’s make a play for local council governance on a larger scale and then, as your Mayoral candidate puts it, act independently. Hmm, I don’t know if that’s believable. I did notice her Brown and Orange ensemble reminded me of the 1970’s. She’s obviously living the Greens image and taking recycling out into the electorate shopping at places such as Good Sammy’s and Vinnies. Not that there’s anything wrong with that, and some might suggest it a rallying point to those Greens members who want to support her. Seeing this sort of carry-on, especially since Canning has recently had to be reformed is concerning especially given her role in the Greens. I did find it amusing when her Greens statement called for “financial” sustainability. I cannot agree with that. Another interesting point, is that, similar to Fremantle’s collection of would-be and continuing councilors, they are not making any statements about what they will do over the next 4-year period if elected. I.e. the basis of their election campaigns is on personality NOT policy. Its a collection of flowery feel-good statements about ‘continual improvement’. Yes, that’s all well and good, but “what improvement???”. Those types of statements show a lack of leadership and vision, as do the lack of statements about not knowing what they will try and accomplish in 4-years on council. The lack of quality of candidates is appalling. The biggest worry is her playing the gender card to seek Mayoral office. Reading this has made me realise that Canning’s troubles aren’t over yet and may actually be getting worse. Greens membership busy backing their candidate for Canning byelection until Sept 19th, maybe they’ll suddenly swing in to action behind Ms Cunningham after that, or maybe they’ll just be electioned out.